"By 9am most of Kingsland School's pupils have arrived. On entering the neat, Victorian building in residential Oldham, the young people are searched, handing over mobile phones, lighters or cigarettes to cheerful reception staff for the day. As they enter the school hall, teachers greet them warmly and chat. Some of the school's 93 pupils came early for free toast at breakfast club. If it's a Monday or Friday, they go straight to class. The rest of the week, days start with form time. But some children need a few private minutes before they are ready to learn. "If you need to have time out, they say 'Just go and have five minutes'," explains year 11 student Chantalle Kennedy, 15. "The staff sit with you, but they won't say anything until you're ready to talk. Some people just need to see the teacher cares." "Just take five minutes" is an often-used phrase at Kingsland. 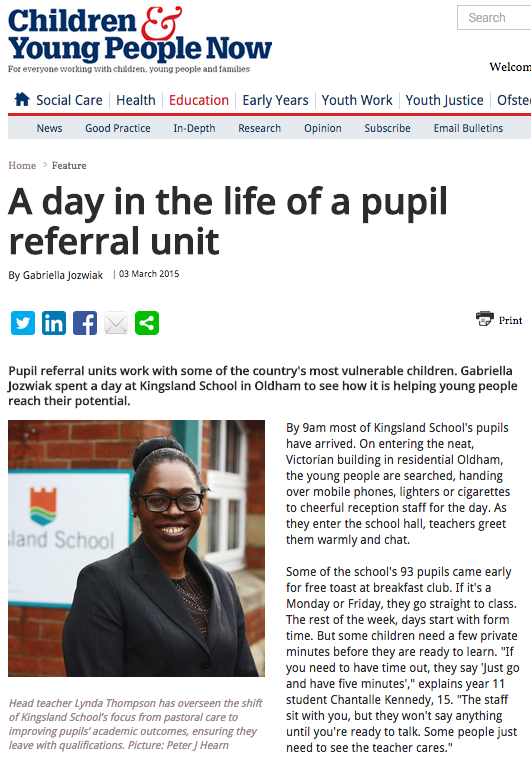 As Oldham's only pupil referral unit (PRU), it caters for children permanently excluded from mainstream school, and those with medical or psychological needs. The two services are delivered in the same building by the same staff, but completely separately. The pupil support centre (PSC) is for children with undiagnosed special needs, disciplinary or behavioural issues resulting in a permanent exclusion. The specialist learning centre (SLC) takes students referred by child and adolescent mental health services, with a medical problem or who are pregnant..."
Read the full feature at Children & Young People Now online. No doubt people referral unit is doing great job.Its a noble cause and I also want to add my share to educate those vulnerable children who need us alot.